There are times when having your dog underfoot may not be safe or helpful. :) For these times one option is to tether your dog so that you can move freely around while your dog is secured in one spot. 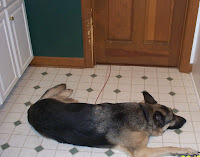 Here our foster dog Duke is tethered while my boys bring in the groceries and the door is openning and closing. (on the left is a great solid Tether we use for our larger dogs and can close in doors!) **** Duke has alot of anxiety and tethering helps him to know what to do and where to be. You can offer your dog a food dispensing toy to challenge him mentally or you can toss yummy treats to him every now and then from across the room just to say "good job" while he is in his spot. Practicing tethering options prior to the arrival of your baby helps this option be more successful once baby arrives. If your dog sleeps in your bedroom and you are planning on the crib or bassinet being in with you then you will want to tether or crate your dog while you sleep. Practice this ahead of time so that your dog is comfortable and used to this once baby arrives.